Every few days I answer a call using clarity.fm – a service where people can ask me questions and only have to pay by the minute. It’s a great deal for me (as I get paid for my time and expertise), and a great deal for customers (who don’t have to pay for a full engagement or even a full hour to get advice). More often than not, the questions revolve around WordPress and membership sites. And recently I’ve been noticing a trend – the selling of video courses on WordPress. For the last three weeks I’ve had calls where people want to simply sell online access to video courses. Because they think of it as “access,” they automatically think of membership plugins to protect their content. Sometimes people discover that the membership plugin they are using doesn’t let a person buy more than one membership – which kills the potential for a person to buy more than one video course. Sometimes people discover that their membership plugin doesn’t integrate with their eLearning plugin – which kills the potential for a seamless integration or customer experience. Selling video courses online doesn’t require a membership plugin. I’m not saying you can’t do it this way. Sure, you can use a membership plugin to protect a page. On that page you can drop videos. Presto, you’re set. But you don’t need to do this. Instead, you can use an online learning plugin instead. WooThemes are the folks behind WooCommerce (a free eCommerce plugin for WordPress). They also happen to be the folks behind Sensei – an online learning (or eLearning) plugin for WordPress. And while you have to pay for it (as of right now, $129), it’s completely worth it – especially if you’re creating an online video course (or courses). Sensei let’s you link courses to products, so that you can sell them. This integration makes it really easy to let people purchase as many courses as they want (concurrently) and limit access to these courses to only those who have made those purchases (something that happens automatically with Sensei). The result is that you can build an entire set of online video courses without a membership plugin. It’s as easy as putting the video url in the right spot for each lesson (each video) you have. And here’s the final missing piece for me – to be able to strongly recommend Sensei to you. It’s finally about to introduce Drip features. 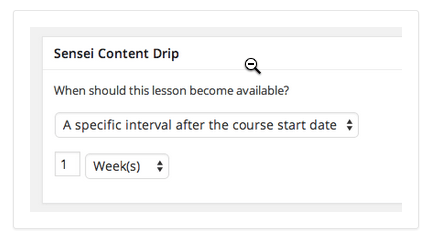 Dripping content means you can schedule when new content becomes available to a learner. This is helpful in terms of ensuring that people keep coming back. It’s also a great way to protect your content from folks that quickly log in, download everything, get out, and ask for a refund (yes, they exist). This is awesome and puts the cherry and whip cream on the sundae, if you know what I mean.